Conventional or bullseye pistol competition in a nutshell - not the official rules. The IPA is a group of shooters in teams that compete against one another in an NRA sanctioned league located in upstate New York and northeastern PA. A minimum of five shooters makes a team. Team scores are based on the scores of the five top scoring shooters for each match. 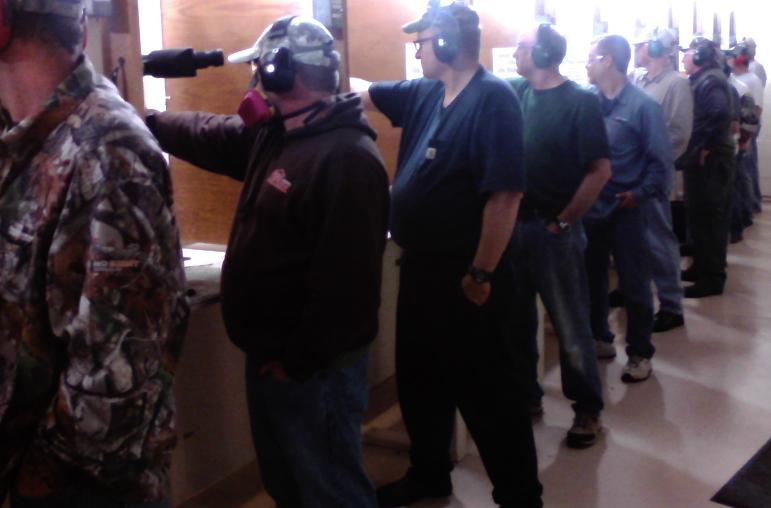 Currently we have eight member teams shooting on four ranges on a rotating basis. See Schedule, League Program and Member Clubs and IPA Team Captains listings. Teams shoot at their home range or away at another team's range about every other week on a rotating basis through the winter season. Currently there are four indoor ranges supporting league shoots. They are Broome County Sportsmen's Association in Kirkwood, NY, Binghamton Rifle Club in Binghamton, Tioga Sportsmen's Association in Owego, NY and New Milford Rifle and Pistol Club in New Milford, PA. All four ranges are well lit, ventilated and heated with multiple firing points at 50 feet. There are two major classifications of guns and two types of matches fired: Rimfire (.22 cal) and Centerfire (.32 to 45 cal.) Each fires a separate match though mixed (rimfire and centerfire) matches do occur. Guns may be revolvers or semi automatic pistols with iron sights or optical sights (scopes or red dots - not lasers.) The semi auto pistol equipped with an optical sight is the most popular. Shooters may shoot only 22, or centerfire, or both. Ranges require that all ammunition must be lead bullets only - no jacketed or magnum ammunition is allowed. Reloaded ammunition is very popular with centerfire shooters as it is less expensive, more readily available, and can be tailored to the shooter's gun. Shooters are assigned a shooting position which is verified by the range officer, then three minutes are allowed for the shooters to handle their firearms and prepare for the match. The LOAD command is given, followed by the standard commands - Is the line ready - the line is ready - ready on the right, ready on the left, ready on the firing line at three second intervals before the targets are presented (and/or a signal sounds)and timing/shooting begins. At the end of the firing sequence, guns are unloaded or empty, actions opened, magazines removed, empty chamber indicators in place, guns are set down on the bench, made safe and not handled. The range officer inspects the line to ensure guns are safe, not being handled, and targets are then changed. If it is the end of a match, shooters are told to box their firearms. Eye and ear protection is required. Many shooters opt to wear air filtration masks, but they are not required. All shooters should wash hands immediately after shooting and before eating. Shooters must have a current state pistol permit , except junior shooters which must be supervised by a permit holder. Shooters must belong to a pistol team and the league. Interstate transportation laws must be carefully followed. Competition guns must be unloaded and boxed or cased when brought to the range and firing line and not handled or loaded until range officer gives the appropriate command. Guns can be shared by shooters when team captains are informed to allow scheduling. If a shooter has a handicap, he/she may apply to league officials and considerations may be given within NRA guidelines. Ideally, scoring is done by experienced members from different teams. One "reads" the target, another writes the score on a card, then the slow, timed and rapid scores are totaled for an individual's match score. Any disputes are settled by team captain of the opposing team. The top five shooters for a team make up the team score. Individual averages are maintained and shooters are classified with an NRA classification according to their average. Team captains forward scores to the league statistician for recordkeeping entry. If a shooter cannot attend a match, they can "shoot ahead" by advance arrangement with the team captains. Four shoot-aheads are allowed per shooter per season. 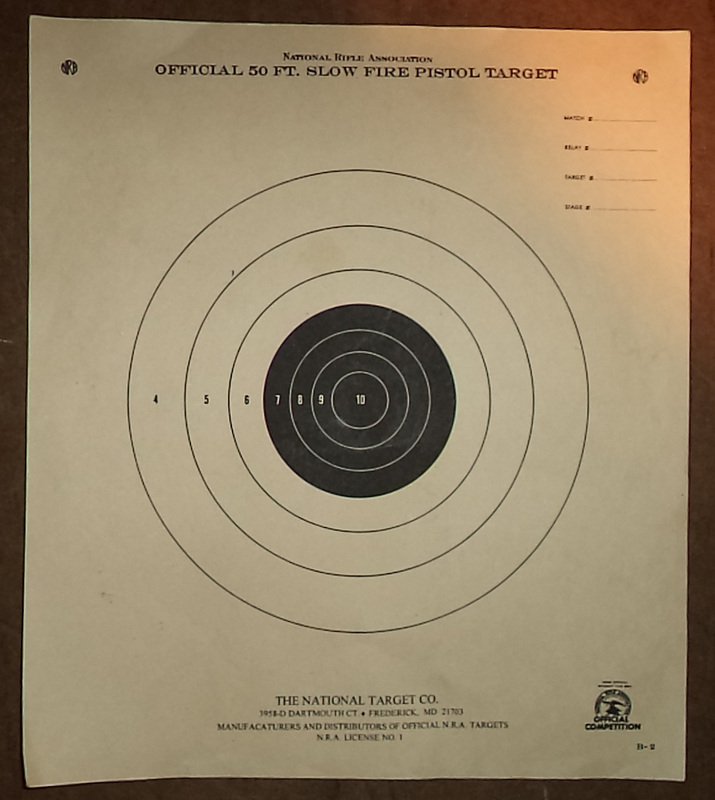 If a shooter experiences a malfunction during a timed portion of a match, the range officer may allow that shooter an "alibi" after inspection . Shooters should keep their firearm pointed safely downrange, notify the range officer by raising a hand. An alibi may not be allowed if shooter tries to correct it before range officer inspects it. An alibi string will be fired after that segment of the match is completed and the shooters target will be marked with the number of alibi shots. For example; a jam after 3 shots in one of the two 5 shot strings: shooter will refire a 5 shot string and target will be marked 13 shot alibi. The target will be scored with the lowest 10 of the 13 shots. Only one alibi is allowed per match. A shooter experiencing more problems than one alibi may cancel or accept scores to that point. See current NRA rules for the official rules governing pistol competition. Teams hosting a match usually provide coffee and refreshments. Soda and bottled water are usually available for purchase. At the end of the season an awards banquet is held. Carpooling to "away" matches is commonly practiced. Teams generally gather at the designated range around 7 P.M. Friday night, and shooting starts around 7:30. Sometimes there is a "double" match where 4 teams are shooting. Bad weather may cause a match to be rescheduled; time at season end is allowed for makeup matches. 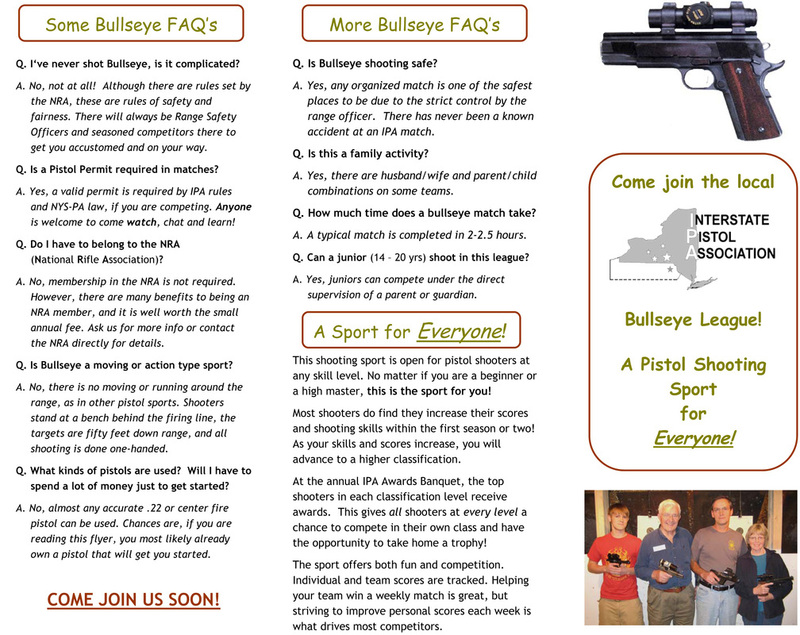 Bullseye or conventional pistol shooting is, has been and continues to be a safe and enjoyable sport. Taken from the Preface of the By-Laws of the Interstate Pistol Association, Inc. 1968. As memories grow dim and the past slips over the horizon, there is always a time that we should look back to see how far forward we have traveled, and place before our new shooters the records of our past. At the conclusion of this 1968-69 Season, the Interstate Pistol Association completes its 32nd year of organized pistol competition. It is difficult today to find many men who can recall those beginning years. Fortunately a few people still remember the summer of 1936, when Doug Wintermute was looking for competition for the newly formed IBM Pistol Club. In can­vassing the Southern Tier Area, Mr. Wintermute learned that the majority of interest in com­petitive pistol shooting centered in the vari­ous police agencies of the area. At the organ­ization meeting held at his home, the only other civilian club represented was the Towanda, Pa. Rifle & Pistol Club. Other clubs repre­sented were; Binghamton Police, Endicott Police, Johnson City Police, Oneonta Police, Scranton Police and the Susquehanna Railroad Police. Mr. Wintermute was elected the first president, Endicott Police Chief Roy Wike, vice-president, and Oneonta Police Chief Norton was secretary-treasurer. Others present at this meeting were Dr. Braham, Ray Mosteller, Ralph Bogart, Ralph Adriance, and Mr. Overbaugh. The course of fire was determined to be 50 feet, and the competitor could fire either .22 or .38 caliber guns in the matches. The shooting of the .38 caliber pistols in direct competition with the .22 caliber pistols was allowed because of the lack of .22 caliber target pistols with police officers of the league. A two point handicap for shooters firing the .38 was discussed, however it was agreed that the people shooting the .38 had enough proficiency that a handicap was not necessary. From this meeting emerged an or­ganized pistol league which was rightfully called the "Interstate Pistol and Revolver Association". From this point on the association settled down to the business of competitive shooting. With the organization firmly formed, competi­tion and interest increased, leading to new teams joining the organization. By 1939 the league had been expanded to include the Parlor City Club, Broome Co. Sheriff Dept., Binghamton Revolver Club, Scranton Revolver Club, and the Oneonta R & R.
The keenness of competition led to the com­petitors standardizing on a .22 caliber pistol for competition. The matches were now .22 caliber gallery course for Team and Individual Score and a separate Center Fire course for individuals who wanted to compete between themselves. The league came to a standstill between 1942 and 1946, as the shooters had to focus their energies on the more important target of defending our country. It was not until late 1945 that the league came forth from its dormant state and reorgan­ized, and competitive shooting was resumed. By now many teams had changed and new ones formed. These included Binghamton Rifle and Pistol Club, Scintilla, Hillcrest American Legion, Stockade, Square Deal, Binghamton Police, Ithaca Rifle & Pistol, and Owego. The competition continued very similarly to what it had been before the war, with the only changes being teams dropping out or new ones becoming members, and a change from the Army - L target to the NRA 50 foot gallery target. The league entered a very content period. In the 1957-58 season the league underwent a complete overhaul. A new constitution was written; three-man center fire teams were added to the A division; the NRA type of classification system was adopted with the addition of a new class called the Pro-marks­man, to allow the new shooters a more competitive class. In an effort to encourage equal competition a new system of calculated awards was added to the standard awards system. This allowed a shooter to compete against his own average, and was called the "Percent Possible Improvement" (PPI). With the new constitution also came a new name, The Interstate Pistol Association, and henceforth the IPA as we now know it. Things have changed slightly in the last few years. Centerfire has become popular, with A league going to 5-man teams, B league to 4-man teams and 3-man teams in the C league. The league took an important step forward in the 1967-68 season when it incorporated, thus protecting the officers and members of the league. In 1967-68 it was necessary to revise the constitution to make it a more effective governing policy. In reviewing the events of the past, it is plain to see that the league has steadily moved forward. With it have come improved scores. It is not unusual, now, to have a team shoot over 1400 for a .22 caliber match. This was first accomplished on November 12, '58 when the Binghamton I team posted a 1406, but it took eleven years before Ithaca A could be the first team to average over 1400 for the season. IBM has the high honor of being the only team to break 1400 with the center fire guns. Beyond these scores lie a very chal­lenging field, a field that will open up only through keen competition and honest hard work.